The Standards for the SDGs event took place as a side session to the 41st ISO General Assembly (GA) and brought together representatives of the standards community, UN agencies, corporate entities, diplomats and national policymakers. This multi-stakeholder engagement showcased the role of standards for the achievement of the UN Sustainable Development Goals (SDGs). Please see the Event Flyer and current website for more details. The event explored the potential of voluntary standards as powerful tools in the achievement of the Sustainable Development Goals. A standard is a document, established by consensus and approved by a recognized body, that provides, for common and repeated use, rules, guidelines and characteristics for activities or their results, aimed at the achievement of the optimum degree of order in a given context. Please see and download the detailed final programme of the event. Bernard Gindroz, ISO/TC 268 on "Sustainable cities and communities"
Åsa Kyrk Gere, ISO/TC 292 on "Security and resilience"
Chikako Makino, ISO/TC 207 on "Environmental management"
The submission of case studies is now closed. We thank all experts having submitted a case study. The event provided a unique opportunity to connect the standardization community with high-level representa­tives of the United Nations agencies, Geneva-based international organizations and NGOs, the diplomatic community, and national policy makers, who do not usually have an opportunity to engage with standards-setting bodies. 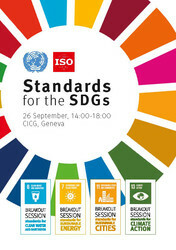 UNECE invites all interested parties to contact regulatory.cooperation@un.org for further information on the event, and to follow on the conversation on Twitter #StandardsfortheSDGs.